!!! No nesting activity or territorial grins around?? With allot of excitement and anticipation of a nest in the making over the past five months, we are saddened to report the unidentified resident (off again - off again) peregrines have flown the coop! After months of daily and weekly sightings of an adult pair of peregrines hanging around the Bell building and were observed going in and out of the old hack box, it appears that they flown the coop. The last three weeks have been a bust as they say, in that we have not seen either of the adults on site for the past three weeks. The usual roosts around the territory (including that of the huge water tower at Warden and Eglinton) has also been void of any peregrine sightings during this same time frame. Today, and for the last week, we have seen crows, pigeons, Sharpies, and now Kestrels on the building roof top, but no signs of any peregrine activity at all. 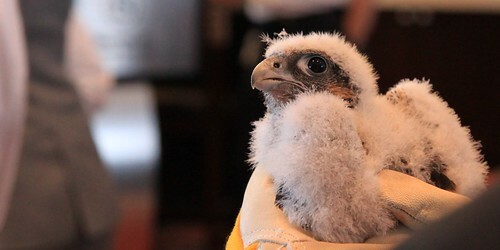 We can only speculate that the peregrines were either sub adults not biologically ready to produce, moved to another more attractive nest location, or that they simply failed at bonding & courtship with one another. Remember that the female does not accept every male suitor that comes a calling! We will continue to keep a very close eye on the old hack box that drew their attention in the first place. For the past 2 weeks,there have been several sightings of a Peregrine Falcon,which I believe is a male adult,at the water tower near Warden and Eglinton. My friend Murray Shields saw it twice,one week apart,perched under the tank. This location is nearish both our former hacksite of Pharmacy and Eglinton and a nesting site which is abit further north at the Yellow Pages building,at Markham and Milner. On one of his visits,Murray spoke to someone who worked nearby and the person told him the bird had been there for a month or so. Thanks to Murray for the photos. When I observed no 2nd Adult present @ Yellow Pages, I decided to check Bell, and sure enough there were 2 Adults present on the East Side of the Building sheltering from the fairly strong Wind. That Wind plus the positioning of the Birds prevented me from checking the leg Bands of the Birds especially the Male which is suspected of attending the Females @ both Sites (Bell & Yellow Pages). Anyway this suspicion will not be put away until an observer is present at each site at the same time. !!! PM Observation. Confusing indeed! Could the same adult male be servicing two different nest sites? Yet another site visit this evening to the Scarborough Bell site produced yet more confusing information. Marion and I spent several hours this evening wathing Linn hanging tight around the Bell building with no particular interest in any part of the building. She was observed having just finished her diner and with a huge buldging crop. No male was observed or present during this period. Bruce called during this same time frame from the Scarborough Yellow pages nest site and did have both adults in his view at the same time. He reports that the adult territorial male at Yellow pages may in fact be Ruben as the USFW band colour is pinkish in colour and not silver as earlier suspected. This would confirm that Rueben is still Lawrie’s mate and the territorial male at this nest site,, AND is the same male that was observed several days ago by Marion, Bruce and Kathy at the Scarborough Bell site copulating with Linn! It was obvious that Linn is not incubating any eggs as yet, as during this observation period she was observed roosting on a ledge well into the darkness and was not down incubating…. It might appear that we have yet another male “servicing” two diferent females at two different nest sites as with Whindwhistler from the 18 King Street nest site and the Toronto Sheraton nest site. Remembering that he was servicing both these nest site for several years and responsible for fertilizing both sets of eggs at these two nest sites for several years in a row. Talk about double duty! Stay tuned, as this could get very interesting indeed!! We stayed until it was too dark to see clearly and watched Linn settle in for the night on the upper east ledges of the building. !!! One Mystery Solved, and another mystery surfaces?? After leaving the Yellow Pages nest site, we headed off to the Bell site to check in on Linn to get an update on her status. After more than an hour at street level scanning both the communications tower and every nook and cranny of the building, (and with absolutely no birds in sight), we decided to check in at the hack box to utilize the peep holes to see if she was home. Not only was no one at home, there was no evidence of any activity in the hack box. No scrape, no eggs, and no peregrines. Seconds later as we were exiting the roof, we heard vocalizing coming from the direction of the communications tower to the east of the building and before we had a chance to react, we were aggressively stooped and pursued from above as Linn seems to come from no where. Very aggressive & protective behavior indeed! Very territorial! No male was observed during this visit. After arriving back at street level, we both concluded that Linn may have produced / laid eggs somewhere else on the facility, (and suspected that her mate was currently incubating). This would explain both her protective behavior and the lack of her mate’s presence. We stayed and watched from the street level for the next hour and never saw the presence of a male, nor did Linn return to any part of the building, preferring to roost on the communication tower to the east of the building. After returning to the CPF office, we received news about the band number of the male that Marion and Bruce had watched and recorded several days earlier when they observed this male involved in a three hour plus long courtship and 8 copulations with Linn during this time frame. The males band number was observed and recorded by both Marin and Bruce as being a Black 43 over Green M belongs and belongs to non-other than Rueben!! Rueben was Lawrie’s mate here at the Scarborough Bell site in 2005 & 2006. Now the more interesting part: Rueben is currently the territorial male at the Scarborough Yellow Pages nest site with Lawrie!! So it appears that Rueben has two homes and is servicing two different female mates!! Friday May 15,2009: Went back to Bell, this time with my own Scope, and spent about an hour or so trying to see the Male’s and confirm the Females Bands. Much to my surprise I accomplished something I have never done in 12-13 years of Observation, and that is confirm 2 Band Numbers in one day. Both Numbers & Letters are in the Upright Position. Please check back to this Page as I expect Mark will have the ID’s on these birds within the Week. At about 3:45 Wednesday afternoon Kathy and I stopped in at the Scarborough Bell Site to see if the birds Mark and I saw on Tuesday were still there and still active at the box. I brought a spotting scope with me in the hope I could get their band numbers and identify the pair. At first we saw nothing but about 5 minutes later 2 falcons flew off the tower and landed on the nest box front porch and copulated. By 4:00 Kathy had to leave me still running and at about 4:30 Bruce joined me on the chase. We then spent about an hour and a half running from one vantage point to another as we no sooner got the scope and tripod set in place and focused on one of them when it would fly off to another position or the male would fly in or off and copulate with her. finally at about 6:00 they settled down and Bruce and I were able get a good look at the black and green band on the Female and got the numbers and saw a pinkish band on the male but he wouldn’t Show the black band. We were anxiously waiting for Mark to show up with his camera so he could get some photos of the pair to help verify the band numbers and confirm what we were seeing when they copulated again for the 8th time just minutes before Mark arrived. Linn from Rochester New York is back at Scarborough Bell nest Site and has found a friend. They are in full blown courtship mode! !